Atlanta, May 16, 2016 – In 2015, Tyrone resident Tony Pourhassan celebrated the ten-year anniversary of his company – Highlight Homes. Looking back over the last decade, a clear evolution has taken place as Pourhassan continues to build his company from the ground up just like the new construction homes he first built in communities he helped develop. Following a meteoric rise over the course of the first three years of operation, the bubble burst in the housing market in 2008. Pourhassan – like so many other builders in Georgia – was forced to make some tough decisions, including minimizing his staff and shifting his focus to more viable means of keeping his company afloat. Highlight Homes survived the Great Recession by rebranding itself as a luxury renovation company – which it did to great success, earning a highly esteemed Obie Award from the Sales & Marketing Council of the Greater Atlanta Home Builders Association along the way. In 2014, Highlight Homes began to explore new ways to expand and grow slowly and cautiously – breaking into the semi-custom home market and applying that same level of one-on-one customer service that had worked so well during the lean years. Today, buoyed by the success of his semi-custom ventures in some of Atlanta’s most sought after neighborhoods, Pourhassan plans for growth once more as he adds custom homes and land development back into the mix. His first step in this exciting new direction includes the introduction of a new logo and launch of a beautiful new website – HighlightHomesGA.com. Designed by Keener Digital Marketing and showcasing beautifully captured images by Never the Rock Photography, the new website features all of the service areas that Highlight Homes now encompasses: Custom Homes, Semi-Custom Homes, Luxury Whole Home Renovations, Land Development and Architectural/Interior Design Services. It also includes a number of neighborhoods in which Highlight Homes focuses, available Semi-Custom Homes and gallery of Highlight Homes’ work, as well as articles about the latest trends and helpful tips for homebuyers/homeowners. Clients will benefit from a special project portal that allows them to keep up-to-date on where their renovation or custom home construction stands and document change requests/communications with their project manager. 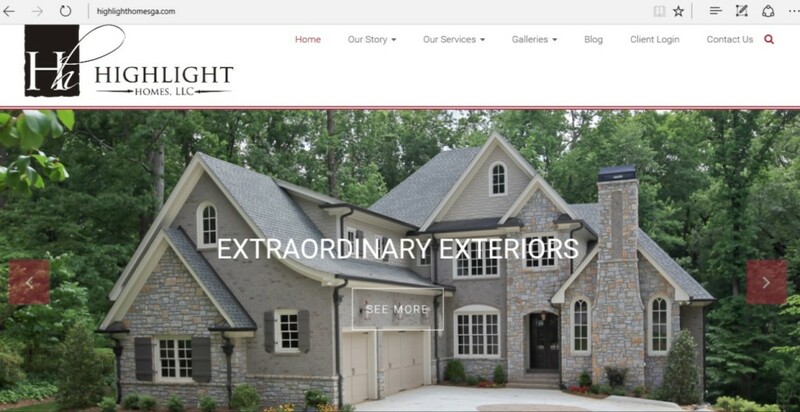 To learn more about Highlight Homes, prospective clients and real estate professionals are invited to visit www.highlighthomesga.com. Highlight Homes sets itself apart from the fray of other builders in the market through their attention to even the smallest detail, paired with their trademark of infusing unexpected touches and luxury finishes into every project they complete – at surprisingly affordable prices. They stand by every house they build by extending a one-year follow-up maintenance call to their homeowners, as well as a one-year full service warranty and an astounding EIGHT-YEAR structural warranty – all at no additional cost. In response to a growing need in Atlanta, Highlight Homes launched their renovation division in 2009 and custom construction division in 2014.